I am having problems importing the SampleApps for GooglePlayGames (Git: https://github.com/playgameservices/android-samples.git) in Android Studio. Gradle 'BasicSamples' project refresh failed: A fatal exception has occurred. Program will exit. I installed Android Studio "0.4.2" and updated to "0.4.6". On both versions the error occured. 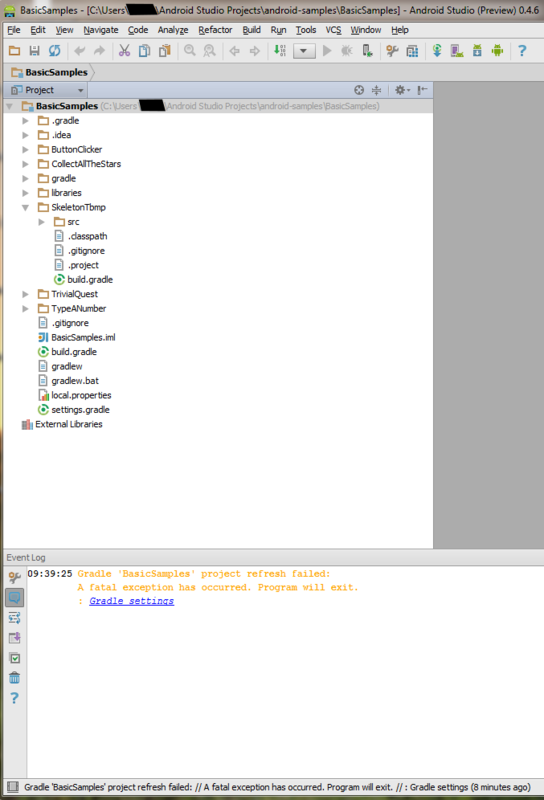 Below is a screenshot from the IDE and its current setup after importing the project. 2014-02-28 08:43:58,169 [ 16187] INFO - .project.GradleProjectImporter - A fatal exception has occurred. Program will exit. Any idea what could lead to this failure? I followed the guide on android studio 0.4.2: Gradle project sync failed error but that didn't solve the problem. I have no clue why its working now... After multiple restarts from the IDE the project is being built successfully. Now the ".iml" files are shown in each of the sample app. Problem -> The program never exists, this error will appear, when either trying to make, rebuild or clean. Android Studio will not detect any code changes or compilation errors within the code, and if you try to run, you'll get the same error but the app will still launch, however, on the previous build that was actually completed. Solution -> A restart of the PC seems to fix this and sometimes a restart of Android Studio however, not found anything patterns that actually cause this issue to begin with.